Partly cloudy with afternoon showers or thunderstorms. High 71F. Winds W at 10 to 20 mph. Chance of rain 50%.. Partly to mostly cloudy skies with scattered thunderstorms during the evening. Low 39F. Winds NE at 15 to 25 mph, becoming W and decreasing to less than 5 mph. Chance of rain 60%. 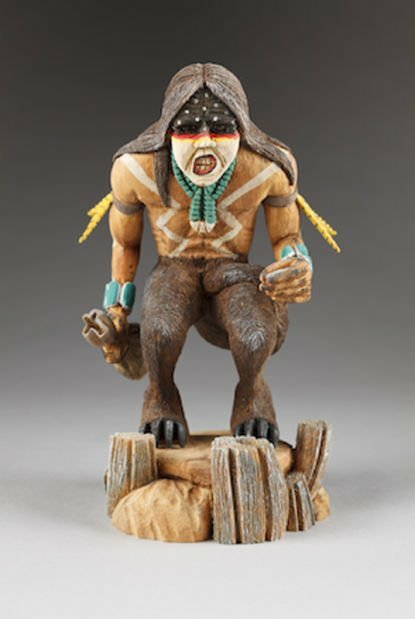 'Skin Walker' done in 2010 in wood and pigment by Navajo artists Marvin Jim and Grace Begay. 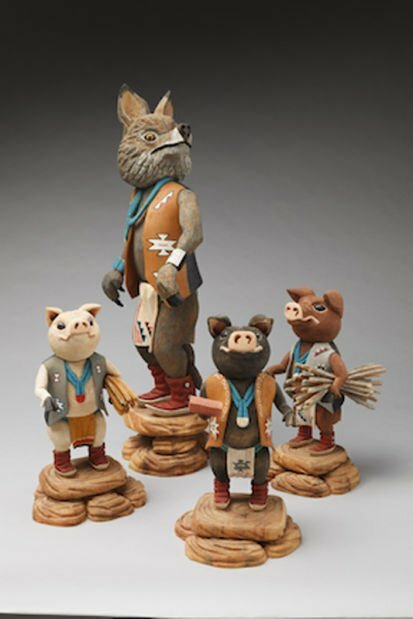 'Bad Wolf', 'Piggy #1 with Straws', 'Piggy #2 with Sticks', 'Piggy #3 with Bricks' done in the 2000s with wood and pigment by Navajo artists Marvin Jim and Grace Begay. Explore kachinas from Navajo creation tales at the University of Wyoming’s “Contemporary Kachinas from the UW Art Museum Collection” exhibit. Kachina carvings are traditionally a Hopi practice, but many Navajo artists adapted the tradition to explore their own culture and the role of animals in Navajo folklore. Animals play a dominant role in creation stories and refer to a time when animals walked upright to create a new world. The legends emphasize mutual respect, compassion and equality among beings, as well as the idea that all beings are of equal importance in the community. The artists use the kachinas to recreate the lessons taught through myths, and use animals in humanistic forms and upright positions to illustrate the strong connection between humans and animals. Because of cultural taboos, Navajo artists typically do not carve specific deities of their own culture. The use of animal representations in contemporary kachinas have played a major role in the development of Navajo carvings as a genre of their own.